Having lost against Southampton at Old Trafford and relinquished the 3rd spot, Louis van Gaal and Manchester United had a point to prove against QPR. But they didn’t start off in the best way to go about proving that point. The first 45 minutes was a torrid affair for the Mancunian side. Sub-par is the word that aptly describes the performance of the men in red.The team wasn’t playing well, there was very little incisiveness and for the some reason, Angel di Maria, a world-class winger was playing as a striker. The only chance United had, at breaking the deadlock, was through Falcao but Robert Green was quick to deny the Colombian and maintain the integrity of his goal. The second half was a different story altogether and Manchester United ran out 2-0 winners against a QPR side who fought valiantly, but were lacking in certain areas. Below are some points that were important, contributed to the scoreline and above all, caught my attention. This should be some good bedtime reading for Mr. Louis van Gaal. With Robbie Savage saying that the central back is not deserving of a spot in the United set-up, Jones had his part to prove against QPR and what better way to do it than go up and take a corner? Ignore the fact that di Maria and Mata were there on the pitch. But to be fair to Jones, his corners were quite good given that they came from a centre-back whose sole purpose is to tackle the life out of people and not to display finesse. On another point, I’d have to disagree with Robbie Savage. Phil Jones is good. Good enough for United. That, is of course, only my opinion. Why use midfielders and strikers in the wall when you can use them to defend against QPR defenders? This was a moment that struck me. 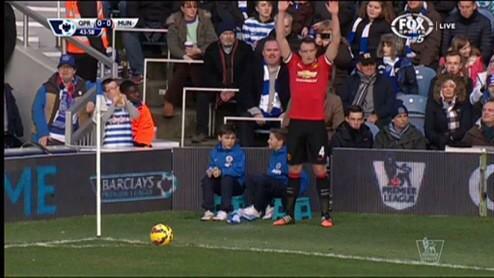 Manchester United were already 1-0 up (if I’m not mistaken) and QPR obtain a freekick just outside the box. There was the potential for a long potshot at goal but to anyone in the stadium and those watching the match, it was pretty obvious that it was not going to be a shot at goal. 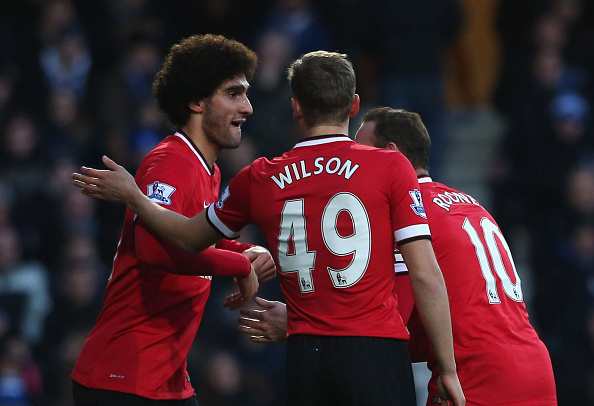 Nevertheless, the wall was made of Fellaini, Carrick, Evans and one other player. Instead of doing the defending against the massive QPR defenders, they were standing in the wall for a free kick that was never going to be a straight attempt at goal. Di Maria and Wilson were doing all the defensive work. Luckily nothing came of it but it had the potential to cause a lot of problem for a defense that was suddenly shorter than average. Louis van Gaal has done his best to develop this United squad to adopt his famed 3-5-2 but unsurprisingly, it hasn’t been working out the way the Dutchman expected. The first half was sloppy; passes were being intercepted, the QPR strikers were shooting a lot more than Falcao and di Maria. There was no team play and the counter-attacking play was slow as ever. It was disjointed, chaotic and just ugly. But as soon as they reverted to the diamond 4-4-2 formation, after the substitution of Evans for Wilson, the game changed. di Maria dropped behind the strikers, Rooney moved to left central midfield with Fellaini at his right and finally Carrick slotted just in front of the defence. 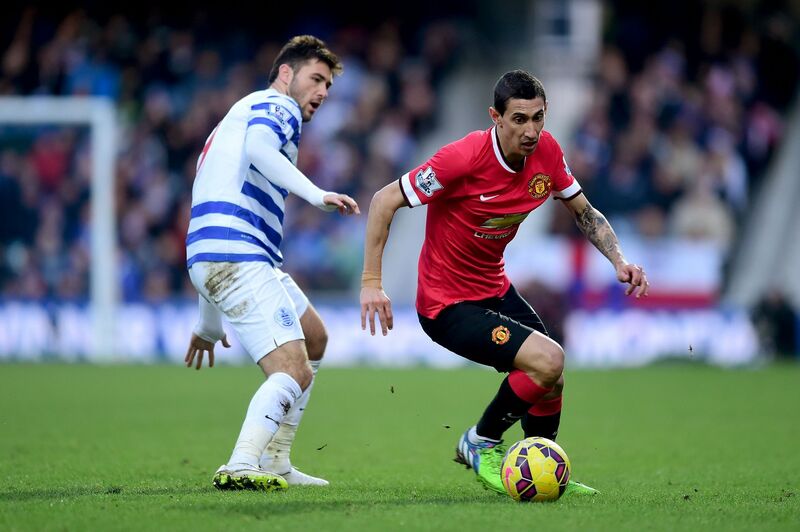 The pace of the game changed and suddenly United were intercepting more, recovering and pushing QPR further back. 3-5-2 hasn’t worked well for Louis van Gaal at United so it’s high time that he ditches it and sticks with the 4-4-2. What do you think? Angel di Maria: Winger or Striker? This is not the first time that I’ve seen di Maria start as a striker and Wayne Rooney as a midfielder. At first I thought that it might work but within 10 minutes of the whistle, it was obvious to see that di Maria was not in a comfortable position. He was picking up the ball in tight spaces, unable to run at the defenders and having to rely on dribbling. But when Wilson came on in the 57th minute, di Maria dropped down just behind Falcao and Wilson and his game changed. He was running at defenders now and not picking up the ball with his back to them. He had the space he needed and thus was more of a threat compared to the first half. Conclusion: di Maria as a winger? YES. di Maria as a striker? NO. Rooney on the other hand is such a versatile player that he excelled in the midfield role but with di Maria in an unfamiliar position, United were not as potent as they could. This season has had two outstanding performers at Manchester United. Of course, David de Gea for his myriad of saves and match-saving parries but also Antonio Valencia for being an outstanding right-back, winger and wing-back so far. In this match, he owned the right wing, from corner flag to corner flag. He had a tough day with Hill but nevertheless got an assist for his hard work. He has selflessly dropped down to defence on several occasions despite being an attacking winger by trade. A hard, fast and solid player. He should get more recognition for the work he’s been doing from the start of the season. Many people are going to say that Falcao had a bad day against QPR and that he could have grabbed a brace. Yes, he had the opportunity to score a couple of goals and even tried a cheeky ‘Hand of God’ but it was not to be. However, there were many positives to take from the match. As the match progressed, he got better at holding up the ball and I have to say that the Colombian is slowly adapting to the physicality of the English Premier League. There was the moment where it seemed that he had missed a sitter, but replays gave the former Monaco man the benefit of the doubt. A last gasp touch from the QPR defender robbed the poacher of a goal. Nevertheless, he still has to prove himself if he’s to deserve a £50 million price tag. Overall, an ‘okay’ performance by Manchester United which was greatly aided by a composed second half. Good substitutions by van Gaal led to the scoresheet being filled with benched players. A mention for David de Gea who performed at his usual best and thwarted the QPR strikers on a couple of occasions. Valdes, you need to up your form in training if ever you want to take your Spanish colleague’s spot. Notable mentions for Marouane Fellaini and James Wilson for bagging the goals that led to United’s first win of 2015 and to Marcos Rojo who endured a physically draining battle against Bobby Zamora but for eventually coming out on top.